Bottega Veneta expands the Parco Palladiano collection with four more: Parco Palladiano XII, XIII, XIV and XV. Parco Palladiano XII (not shown) ~ "Parco Palladiano XII Quercia brings to life the intense energy of the oak tree, from its earthy roots to its calming green canopy. The unisex fragrance is both suave and strong, evoking the quiet yet powerful presence of the tree, the majestic gatekeeper of the Palladian Garden. Its rare oak note is not usually found in perfumery. The fragrance’s deep brown juice is rich in both aroma and appearance. The glass bottle and silver cap are elegantly embossed with the intrecciato pattern and expertly hand-finished." Parco Palladiano XIII ~ "Parco Palladiano XIII Quadrifoglio evokes aromatic herbs, beckoning to scent the breeze. The final composition is subtle yet powerful, with sensual undertones. "As I crafted Quadrifoglio, I aimed at capturing the unique atmosphere of an early morning in the gardens of the Veneto when nature awakens," says perfumer Aurelien Guichard. "A delicate mist subtly fades across the horizon melting the vegetal details together with architecture's lines. I wanted to feel this dewy freshness and natural crispness, and the invigorating breeze of citrus and vegetal texture of basil leaves." The pale green juice captures the light, in a perfect reflection: weightless yet enveloping blend of basil, white bergamot and incense creating a bright radiance on top, lighting up the vegetal texture of fresh aromatic leaves." Parco Palladiano XIV ~ "Parco Palladiano XIV Melagrana recalls the vibrancy of ripe pomegranate, tempered with the pure sunlight of early morning. "The story of this fragrance is built around a spring walk in the flowering Palladian gardens where we can witness the rebirth of flowers and fruits. A sparkling juicy scent emanates when the sun rays touch each of the garden's plots," says perfumer Sidonie Lancesseur. With a delicately pale pink juice, the luminous fragrance combines mandarin with blackcurrant buds, anchored by an intense and resinous cedarwood base." Parco Palladiano XV ~ "Parco Palladiano XV Salvia Blu is an olfactory encapsulation of nature's blue symphony at dawn. Velvety sage combines with a textured rose and lavender recalling spring and nature reborn. "Parco Palladiano XV Salvia Blu is a fragrance of elevation and symbiosis between contrasts. It comes out between freshness and warmth, dawn's dewy light and full morning sunshine. Each ingredient comes in its duality," says perfumer Quentin Bisch. The slate blue-green color of the juice of this aromatic and musky fragrance reflects the precise moment of transition between dawn and daylight. Sage, lavender and rose appear in their duality, unveiling a fresh and warm facet simultaneous abstract and instinctive." 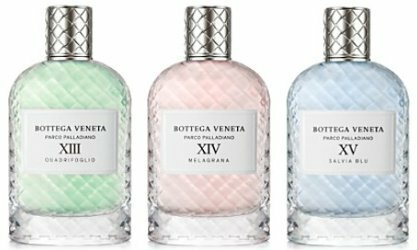 Bottega Veneta Parco Palladiano XII, XIII, XIV and XV are available in 100 ml Eau de Parfum. I don’t know a thing about this collection but the Sherbert-y juice seems a little precious to me, but I’m sure they would be pretty lined up on a dressing table! I would love to know how an oak note is made although I expect I wouldn’t understand if I was told as it’s probably a list of chemicals that would mean nothing to me. I am pretty sure you can do natural extracts of oakwood, but guessing there are also captive molecules that smell like oak.